Chevron Notch, Standard Test Method of Fracture Toughness of Advanced Ceramics | BMS Bomas Machine Specialties, Inc.
Machined per ASTM C 1421 standards. This photo illustrates the actual Chevron-Notch we machine into a bar. 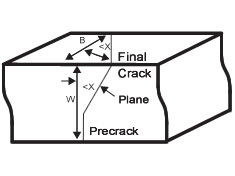 This is a Standard Test Method of Fracture Toughness of Advanced Ceramics. “CHEVRON” refers to the actual shape of the notch after machining.